The Binghamton Mets, the AA affiliate of the New York Mets, have decided, as we briefly noted earlier today, that it’s time for the ballclub to forge boldly onward into the future and delineate their own identity outside of the influence of the mothership. This is noble and good, because minor league baseball is at its best when it’s at its weirdest. Not enough teams are named after lawn-mowing goats or biscuits. I’m not exactly sure what a River Cat is if it’s not a feral cat. Anyway, “Mets” is an already in-use moniker, and the team is making up for years of copycat mascot usage by offering a public vote on some truly great new names. I love when teams tap into strange regional histories with their names, and good lord, get a load of these options. Here are the verbatim descriptions of the six options, which are almost all great. Bullheads: A local inhabitant of the Susquehanna River, a Bullhead is a bullhead catfish. The bullhead displays a tough and resilient character such as the Binghamton community. Gobblers: A symbol of the rich hunting culture of the area, the “Binghamton Gobblers” honors the outdoorsman lifestyle and turkeys who call Binghamton home. Rocking Horses: The “Binghamton Rocking Horses” celebrates the Triple Cities’ rich history as the “Carousel Capital of the World. Stud Muffins: While tipping a cap to the players on the field, the “Stud Muffins” celebrates the collection of carousel horses belonging to Binghamtonians. 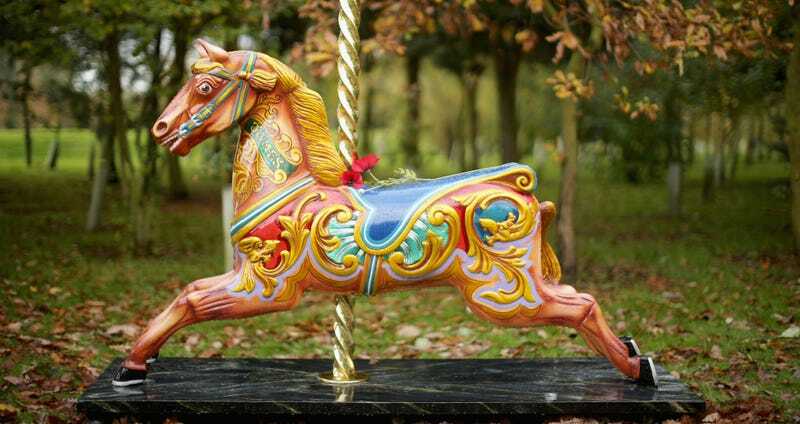 Timber Jockeys: Combining the fun of Minor League Baseball with the rich carousel history of the Triple Cities, the “Binghamton Timber Jockeys” pays homage to everyone that rides the carousels. I’m not gonna spell the innuendos out for you because you’re an adult, but: nice. Only you can make your mind up and cast your vote in 2016's most important election. MLB.com has endorsed Stud Muffins via a headline, but truly I say to you today: Rumble Ponies is the best name. Please stuff the ballot at the Mets’ site and help make Rumble Ponies a real mascot name in 2017. A town celebrating its history as a carousel capital of the world is weird and worthwhile and Rumble Ponies is the best way to do so. Rumble to the polls and make it happen.